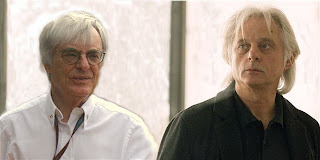 On An Overgrown Path: Is Manfred Eicher classical music's Bernie Ecclestone? Is Manfred Eicher classical music's Bernie Ecclestone? Manfred Eicher, the visionary founder of the ECM record label, is 70 today. To coincide with his birthday the label has released a mid-priced six CD set of their iconic recordings titled Selected Signs III - VIII to complement the retrospective exhibition ECM - A Cultural Archaeology at Haus der Kunst in Munich. The list of musicians featured on the anthology is testament to the power and impact of Manfred Eicher's vision and includes Heiner Goebbels, Steve Reich, Arvo Pärt, Gidon Kremer, Keith Jarrett, György Kurtág, Tigran Mansurian, Rosamunde Quartet, Betty Olivero, Kim Kashkashian, Meredith Monk, Giya Kancheli, Keller Quartet, Hilliard Ensemble, Valentin Silvestrov, Eleni Karaindrou, Jan Garbarek, Jon Balke and Amina Alaoui, Rolf Lislevand, Nils Petter Molvær, Eivind Aarset, Stefano Battaglia, Tord Gustavsen, Egberto Gismonti, Norma Winstone, Ralph Alessi, Anja Lechner, Vassilis Tsabropoulos, Colin Vallon, Christian Wallumrød, Tomasz Stanko, Jimmy Giuffre, Paul Bley, Evan Parker, Barre Phillips, Robin Williamson, Old & New Dreams, Sinikka Langeland, Frode Haltli, Gary Peacock, Steve Kuhn, Wadada Leo Smith and many others. My copy of Selected Signs arrived serendipitously the day before I made a six hour journey by car. So the six CDs were loaded into the magazine of my trusty Skoda Octavia for auditioning en route - digitally empowered readers will be glad to know I dispensed with my Philips in-car record player a few years ago. There are interesting random links between ECM and cars. In Horizons Touched, the official history of ECM, Manfred Eicher recalls how the inspiration for ECM's unlikely best seller Officium came from hearing a recording of Cristobal Morales' Officium defunctorum during a drive through the lava fields of Iceland, while in the pre-ECM year of 1961 Phil Hill listened to a distinctly Eicher-esque programme of Shostakovich and Bartok before racing to his Formula One world championship win. So my headline question of Is Manfred Eicher classical music's Bernie Ecclestone? is not as contrived as it may first seem and my photo montage may yet become reality. There are some intriguing similarities between Formula One supremo Bernie Ecclestone and ECM supremo Manfred Eicher. Both have reached out and embraced new audiences in their very different spheres of activities. Both are, to use the jargon, game changers, both define the personality of the organisations they head, and both have opened up new territories - Ecclestone geographically and Eicher artistically. And both have become legends in their own lifetime. Bernie Ecclestone and Manfred Eicher also share a willingness to ruffle feathers. Formula One courted controversy by making racing more exciting using the artificial Drag Reduction System, while ECM created its seductive signature sound using the Lexicon artificial reverb unit, a dependance that, according to industry folklore, prompted the exit of ECM's high profile guitarist Pat Metheny. Both Bernie and Manfred are master wheeler dealers, which has meant Formula One partnering with the politically-challenged Bahrain regime, while the ostensibly fiercely independent ECM has conducted a passionate and long-running secret love affair with the 800-pound corporate gorilla Universal Music. Both ECM and Formula One face succession problems when their visionary leaders finally step - or are carried - down. And there are also indications that the Midas touch of both Bernie and Manfred is becoming a little tarnished. If, like me, you were there when Senna charge through the field driving a less-than-stellar Toleman at the rain-soaked 1984 Monaco race or when he took his first Grand Prix win with a courageous drive in the wet at Estoril in 1985, you will surely find Lewis Hamilton whining about his car's tyres unappealing. And if, like me, you were blown away by Keith Jarrett's 1975 The Köln Concert and the 2004 Ukraine recording of Valentin Silvestrov's sublime Requiem for Larissa, you will surely find Dobrinka Tabakova channelling Rameau unappealing. Just as Moto GP is teaching Formula One how to put on a show, so young Turks such as the Aeon label with their recordings of the quartet repertoire from Jonathan Harvey, Harrison Birtwistle, Pascal Dusapin, Robert Gerhard and Edith Canat de Chizy are teaching ECM where new music is really happening, while other young Turks such as Accords Croisés are doing the same for world music. And the ennui of yet another Red Bull victory in Formula One is only matched by yet another art school chic ECM CD sleeve. But all that should not detract from the unique contribution that Manfred Eicher has made to classical music, an achievement that is so vividly captured in Selected Signs III - VIII. Which is why I am temporarily abandoning my usual entrenched position and saying that today's music anniversary is something we really should be celebrating. And before enraged readers write in, I am not seriously suggesting that Manfred Eicher is classical music's Bernie Ecclestone - if he had Bernie's $3.8 billion personal fortune ECM would not need to rely on Keith Jarrett back catalogue to bankroll their more arcane new projects. But there are notable similarities between the two, not the least of which is that they are both larger than life personalities in an age of micro-media defined micro-celebrities. Happy 70th birthday Manfred! Selected Signs III - VIII was suppled as a requested review sample; my thanks go to David at Proper Note, one of the few people in the industry who still has faith in independent record stores and independent journalism. Also on Facebook and Twitter.